In many ways, the electorate’s roller-coaster relationship with Nick Clegg – from the love-in of debate-fuelled Cleggmania to formation of the coalition, the tuition fees betrayal and other policy compromises in government – resembles the rise and fall of Tony Blair on fast forward. Blair’s decline from progressive hero to hate figure – from the flag-waving days of May 1997 to the mass demonstrations of 2003, was six years in the making. Clegg managed to alienate almost as many voters in just five months. There is no sign that these voters are near to returning, and the Liberal Democrats can only hope that their local/personal vote saves them. There is perhaps too much emphasis among commentators, then, on the degree to which Labour’s hopes for 2015 are ‘heavily reliant on the continued disenchantment of former Liberal Democrats’. Many of these voters are most likely not lifelong Liberal Democrats, but Labour supporters who quit the Labour coalition during the Blair/Brown years, and have returned to the fold under the Coalition government – ending the twenty year experiment of a social democratic Liberal Party. 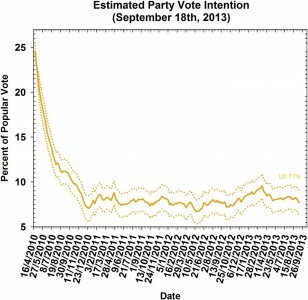 As we can see from the Polling Observatory figures, many of the supporters who left did so immediately after the Coalition was formed, and many soon after. 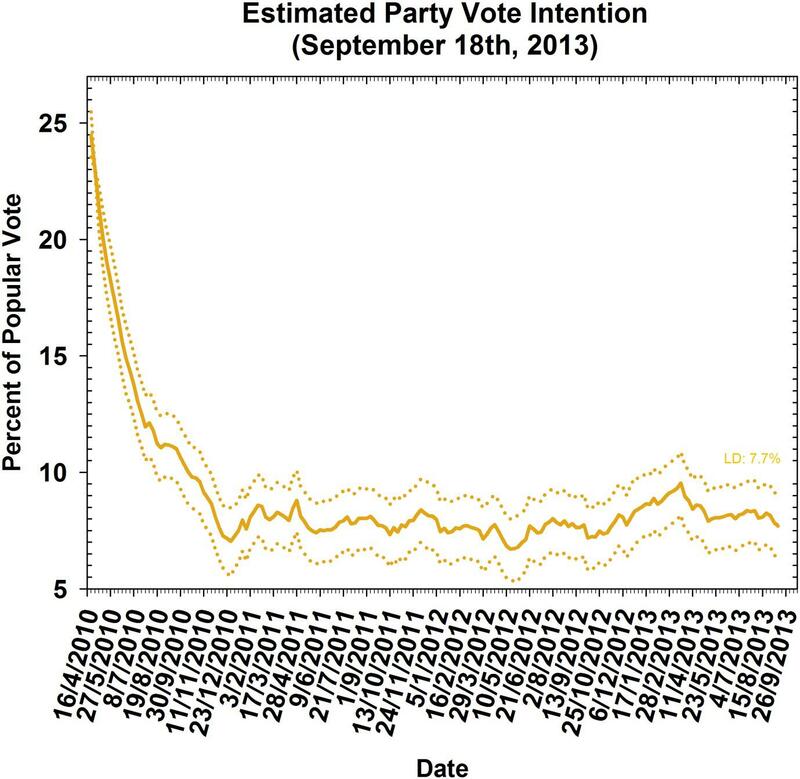 The Liberal Democrats’ bleeding was complete by the end of 2010, and they have not really moved in the polls since. It is not just that British voters are not particularly keen on coalition government. Those who joined the Liberal Democrats from the left were not keen on a centre-right Coalition from the outset. For the Liberal Democrats, the current pattern represents a return to the post-war level of support for the old Liberal Party. The resurgence of the Liberal Democrats as a third way in British politics had been built up by the efforts of Ashdown and Kennedy, only to be dismantled by the project of the orange book Liberals — most notably Clegg, Alexander and Laws. One prominent member of the party’s left wing – Sarah Teather, representing a poor, former safe Labour seat, has already announced her intention to quit at the 2015 election. It will be no surprise if, as 2015 approaches, more prominent left-of-centre Liberals join her, jumping ship before the impending electoral Tsunami hits. Complete electoral disaster may be spared, however, through the personal vote that individual MPs have managed to cultivate in their local constituencies – recent evidence suggests voters in Liberal Democrat seats like their MP better than those living in Labour or Conservative seats, and that such voters remain more willing to back a local Liberal Democrat than the national polling suggests. Perhaps the only question that remains is this: will the Liberals have sufficient MPs in the next parliament to play kingmaker? Clegg would be better advised to stop manoeuvring the party in preparation for the next coalition and instead focus on finding a way to expand a support base that has been on life support for more than three years now.